A Metro Art tour guide discusses the artwork at North Hollywood Station. The ceramic mural by Anne Marie Karlsen, called Kaleidoscope Dreams, depicts the dreams and aspirations of generations of San Fernando Valley immigrants and celebrates the Valley’s spirit and history. Did you know that Metro has worked with more than 300 artists to enhance nearly 100 stations in the Metro system? For those adventurous types out there, Metro offers walking tours that provide insights into the artworks, the artists who created them and the processes of making them. Explore the Metro system and learn a bit about Los Angeles County’s most far reaching art gallery. Thursday, April 4 at 7 p.m. Meet at the street level entrance to the Hollywood/Highland Metro Rail Station on Hollywood Boulevard near the corner with Highland Ave.
Saturday, April 6 at 10 a.m. Meet at the street level entrance to the Hollywood/Highland Metro Rail Station on Hollywood Boulevard near the corner with Highland Ave.
Sunday, April 7 at 10 a.m. Meet at the information booth inside the entrance to historic Union Station at 900 Alameda Street in Downtown Los Angeles. For parking information and more details about Art Tours, visit metro.net/art and click on Art Tours. While docent programs are commonly found at museums around the world, Metro is the first transit agency to benefit from such a program. Free tours are offered the first Thursday, Saturday and Sunday of every month and focus on the artwork along the Red Line (special request tours of other lines, including the Expo Line, can be arranged by calling 213.922.2738). The tours are round trip and last approximately two hours. 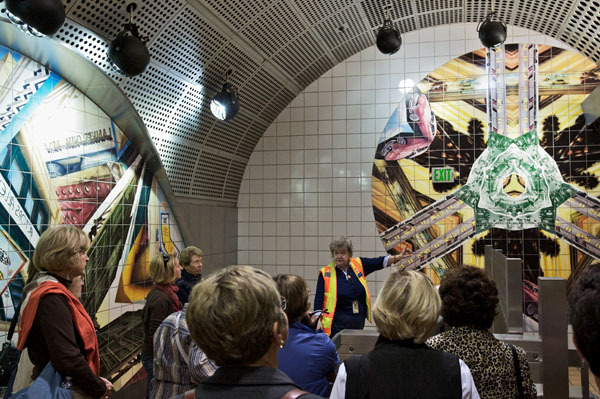 Tours are led by trained Metro Art Docent Council volunteers. No reservations are required! Look for safety vest-wearing docents at the meetup spot.